Image is of a Grey-blue MinUTE cargo bike with an eighteen inch frame and seven-hundred c wheels. Has two large panniers. Bikes for Humanity PDX was recently donated two Kona UTE cargo bikes (a regular UTE and a Mini or Min UTE) and the excitement was palpable. 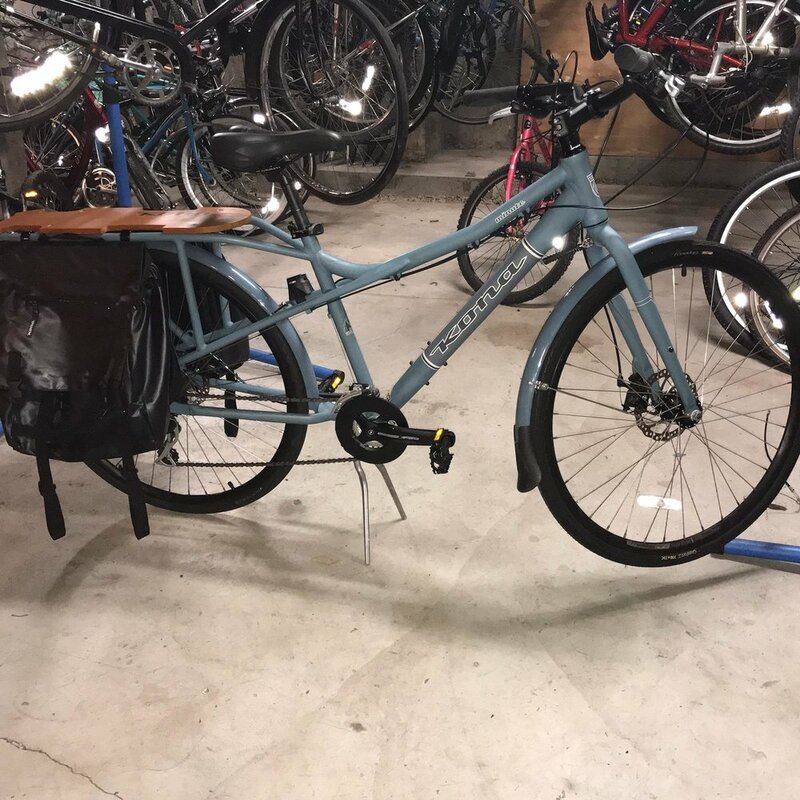 Our head mechanic threw out great ideas for how the bikes could be branded and used by the shop to carry everything we need for giving riding/bike route lessons and hauling tools, parts, and inventory to events and community partnership gatherings. Our board members discussed the potential to raffle or sell for fundraising. Our volunteers in-the-know expounded on the UTE’s many qualities and Kona’s general good name. I thought about how someone could even get the things on a bus rack given that they’re essentially the bike version of an SUV (turns out the MinUTE can go on just fine, but you have to take one of the wheels off of the regular UTE to make it fit). 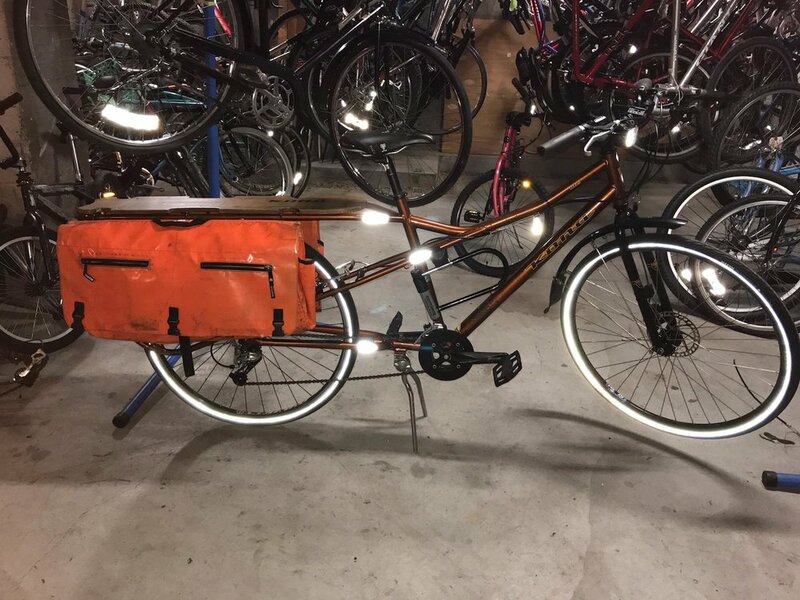 Image is of a Kona UTE metallic orange twenty inch frame cargo bike with seven-hundred c wheels. Has four large panniers. As someone who values longevity and functionality in my transportation, cargo bikes as a whole are difficult to beat. Most are meant to safely haul heavy loads, up to and including young children. The Kona UTE line, like other cargo bikes, offers everything one needs for regular errands and family outings - it works well with car-seats, can be easily modified to add more storage space (for instance, works well with front-rack installation), and is perfect for large panniers. I’m not the biggest fan of the side of cycling culture that tries to convince everyone that bike travel is right for them. For one, it’s been my experience that often folks who proselytize like that either have cars themselves or could afford to rent one if they needed it. For two, it’s been my experience that public transportation options get disparaged in those conversations as being more inconvenient than bikes without regards to people’s individual ability levels or transportation access barriers/needs. However, it’s difficult for me personally to think of very many situations in which a cargo bike is not a better option for many people than a large van in regards to purpose of use, expense, and storage/parking options. We’ll certainly be sad to part with these at the shop. While we can use them for so many things we need, our goal truly is to get bikes like this back to the community. Also, as amusing as it would be to try, I don’t think we’d be able to trade them in to cover rent (but it’s Portland, so who knows?). Check them out to buy HERE. Adult Bike Riding Lessons at PCC!